There is an endless list of plays and playwrights that Kyla holds in high esteem and that list includes the works of Shakespeare, Oscar Wilde, Harold Pinter, Sam Shepard, Eugene O'Neil, Edward Albee, Garcia Lorca and so on. But, she says, ‘If I absolutely had to though, I'd say my favourite play is I Am a Camera by John Van Druten, which is what the famous Broadway musical Cabaret is based on.’ Of all the theatre personalities in India and abroad, there are many she looks up to, but she confides that James Corden, who recently hosted the Tony Awards, is a current favourite. This alumnus of The Lee Strasberg Theatre and Film Institute has added to her repertoire of learning with method acting, voice technique, Shakespeare, script analysis, singing, dance (jazz and ballet), movement and physical technique. She has even gained the martial art of tai chi as part of her training at the institute. ‘The two years that I spent at the Lee Strasberg Theatre and Film Institute was the most challenging and rewarding time of my acting career that helped me grown both professionally and personally,’ says Kyla, who continues to be influenced and inspired by the faculty and students from all over the globe that she encountered at the institute. There are some mentors who have impacted Kyla’s artistic journey more than others to leave a lasting impression and lessons that she adheres to, to this day. Ashley Lobo, the artistic director of The Danceworx Performing Arts Academy, taught her the value of discipline and dedication, while Ted Zurkowski, a faculty member at The Lee Strasberg Theatre and Film Institute, trained Kyla not just to be a method actor but a smart actor, making the right choices for the characters she plays. The artistic director of The Frog & Peach Theatre Company, Lynnea Benson, directed Kyla in off-Broadway productions and in doing so cultivated Kyla’s love of Shakespeare. Then there is Glenn Hayden, who is presently at WAAPA (Western Australian Academy of Performing Arts) in Australia and associate director at The Peas & Carrots Theatre Company. Since Kyla’s first meeting with him in 2009, he has been everything from a mentor to a friend to her. So came into being The Peas & Carrots Theatre Company, which is Kyla’s medium of presenting her idea of theatre as it should be. The name is derived from the phrase used by actors when they are supposed to be whispering on stage. The theatre company was also founded to share the training and professional experience Kyla had gained in her years abroad with those in India who were not so fortunate as to be able to travel to another country for the same. This is the reason the company has workshops for both emerging and established artists and schools, colleges, and corporates that are keen to invest in experiential learning through theatre. The Peas & Carrots Theatre Company debuted in Mumbai in 2013 with Sam Shepard’s Fool for Love. The year 2014 saw a production of Polish writer Slawomir Mrozek's Out at Sea. 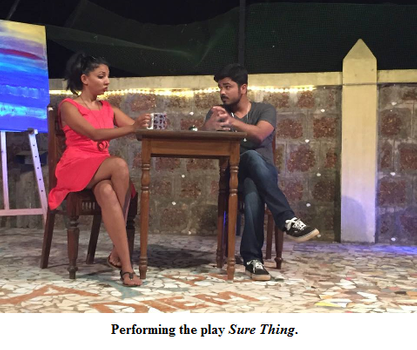 This year (2016) The Peas & Carrots Theatre Company premiered in Goa with two short plays: A No Play and Sure Thing. ‘Each of our productions have enjoyed success in different ways. Audiences in Mumbai and Goa like the same play for different reasons. That's one of the reasons I love doing what we do. You never know how you are going to reach people,’ says Kyla. 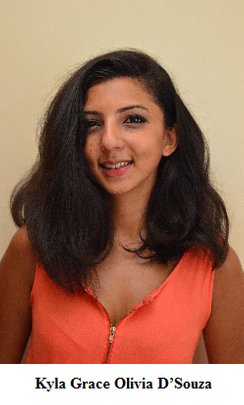 Kyla is a visiting faculty member at the Goa Institute of Management. Here, MBA students are trained in developing self-awareness, creative thinking, confidence, leadership, communication and team building skills. She teaches children (10-14 years of age) as part of the theatre programme ‘In Stages’ headed by Arundhati Chattopadhyaya at Sunaparanta, Panjim. She conducts regular theatre workshops for both children and adults at MOG-Museum of Goa in Pilerne, The International Centre Goa, Miramar, and Casa dos Gamas in South Goa. ‘Theatre, or any kind of art, has a wonderful way of touching people's lives and getting them to listen without dictating or lecturing them. It's that old cliché of 'holding up a mirror to society'.’ Though theatre need not always carry a social message or relay a moral standard for the audience to live up to, it has the definitive ability to present themes that the people can relate to…themes that they might otherwise be unaware of or would be unlikely to give much attention to.